A river of pink flooded downtown Denver this morning as more than 60,000 people ran and walked in the 16th annual Komen Race for the Cure to support people affected by breast cancer. Among the participants was North High School senior Salvador Sonola, one of 25 North ROTC students to turn out for the race. "It is a good thing to do this," he said. "People want to help." Jessica King, 31, an Aurora librarian diagnosed with multiple sclerosis nine years ago, rode in a scooter. She took part in support of her mother in law, a breast cancer survivor. 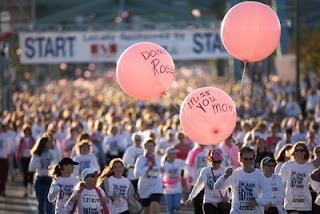 Since the first race in Dallas in 1982, the Komen Race for the Cure has grown to 100 races nationwide, with more than 1.4 million participants expected. Nearly 62,000 people participated in the 2007 Denver Race, one of the largest footraces in Colorado history. Funds raised go to cancer research and community outreach. Race officials said 1,400 volunteers helped stage today's event. THIS PERTINENT COMMENT on the Rocky article about the SGK annual event, is worth pondering. "Find a cure??? Why bother when 60,000 people are willing to make some scammer a zillionaire with bogus running events."